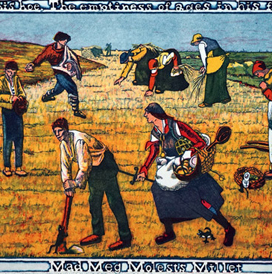 For this series Rothwell has borrowed the image of Mad Meg from Pieter Bruegel's 1562 painting, "Dulle Griet." In Bruegel's painting, Mad Meg has just emerged from Hell, laden with loot. She strides across the scene, armed for combat. The artist's message seems to be WATCH YOUR BACK! Each etching in the series is surrounded by a border message. All etchings in this series are 3-plate color etchings.